A 25-year-old man has been charged with assault after an assistant referee was attacked during the Hearts-Hibs match on Wednesday. Hibs manager Neil Lennon was also struck with a coin during the Edinburgh derby game. Hearts manager Craig Levein, meanwhile, has reported "a punch" was aimed at his goalkeeper Zdenek Zlamal by a spectator. Police confirmed investigations into both incidents were continuing. Five people were arrested at the match at Tynecastle, which ended in a goalless draw. It is thought both assistant referees, Frank Connor and David McGeachie, were targeted by individuals in the crowd. Will it take someone getting seriously hurt? The match commander, Ch Insp Murray Starkey, said: "Police Scotland condemn the mindless acts of violence including missiles being thrown during last night's Edinburgh derby. "I can confirm we are investigating two separate incidents involving the Hearts goalkeeper and the Hibernian manager during the match. "A 25-year-old-man has been arrested and charged for an assault involving the assistant referee. "A total of five arrests have been made during the evening. Anyone who witnessed these mindless acts should contact the police on 101." 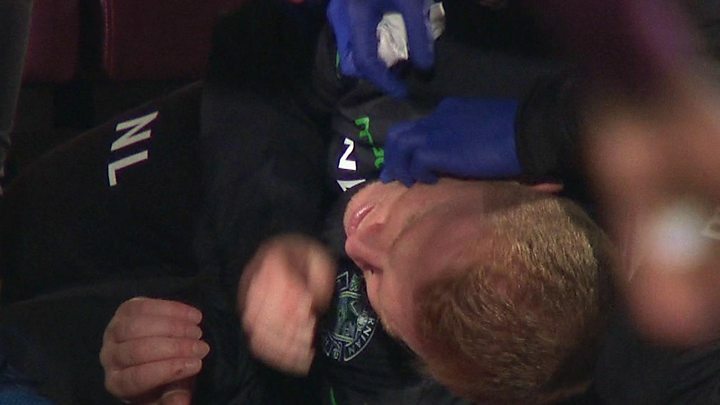 Hibs boss Lennon was struck "on the jaw" moments after appearing to celebrate Hearts having an injury-time goal disallowed. After the match, he said: "People will say I was winding the crowd up; I wasn't. I was just giving a bit back for the abuse I was taking for 90 minutes." Hearts owner Ann Budge called on football fans to report incidents of crowd trouble at games. She told BBC Scotland: "I'm asking our supporters to speak up if they see something of this nature happening. "We don't want people who do this sort of thing involved in football. It brings the whole game into disrepute. "A lot of us are working very hard to try and improve the situation at football and make it an experience that families can enjoy." A spokesman for the Scottish Professional Football League (SPFL) said: "The Edinburgh derby is rightly regarded as one of the most passionate and exciting fixtures in the Scottish football calendar - but a number of incidents last night are not acceptable. "We await the contents of the SPFL match delegate report and will work closely with both clubs and Police Scotland to identify those involved." The players' union, PFA Scotland, said any form of abuse - verbal or physical - was "wholly unacceptable". Chief executive Fraser Wishart said: "It is like Groundhog Day as it seems we are continually having to discuss and address issues like this happening at football grounds across the country. "After last night's incidents at Tynecastle, we stress again that any form of verbal abuse, violence or the throwing of objects at players and managers needs to be taken seriously and we trust that the authorities will take the appropriate action to ensure that this dangerous practice is stopped." He added: "The football pitch is a player's place of work and it is not unreasonable for a player, like any other employee, to be able to work with the knowledge that their workplace is indeed a safe environment, free from violence and discrimination and that their health and safety is not at risk."